Image caption Tha a' Chomhairle ag ràdh gur dòcha gum biodh subsadaidh nas motha mì-laghail. Tha a h-uile coltas ann gun stad seirbheisean-adhair eadar an t-Òban, Colla, Tiriodh, Colbhasa agus Ìle aig deireadh na seachain seo tighinn. 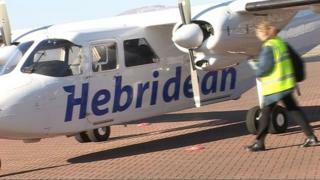 Thuirt Comhairle Earra-Ghàidheal is Bhòid, gun robh a' chompanaidh phrìobhaideach a bha gan ruith, Hebridean Air Services Eta, ag iarraidh subsadaidh a bha a' dol thairis air buidseit an ùghdarrais. Ghabh a' chompanaidh na seirbheisean thairis bho chionn trì bliadhna, ach tha an cùmhnant a' tighinn gu crìch meadhan a' Chèitein. B' iad hebridean Air Services Eta an aon chompanaidh a chuir tairgse a-steach airson an ath-chùmhnant. Bidh Comhairle Earra-Ghàidheal is Bhòid a' cur subsadaidh de £2m ris an t-seirbheis thairis air trì bliadhna. Bha a' chompanaidh ag iarraidh barrachd na sin ge-tà. Fhuair iad cothrom tairgse airson seirbheis nas lugha a chur a-steach cuideachd, ach tha a' Chomhairle ag ràdh gun robh na tairgsean aca uile gu math nas àirde na am buidseat aca. Tha a' Chomhairle ag ràdh gum faodadh subsadaidh nas àirde a bhith mì-laghail, agus nach biodh e a dhìth co-dhiù, leis cho falainn 's a tha na h-àireamhan de dhaoine a tha a' cleachdadh nan seirbheisean. Tha an t-ùghdarras ag ràdh gu bheil iad a' dèanamh na 's urrainn dhaibh gus companaidh a lorg a tha deònach an t-seirbheis a ruith, 's iad mothachail air cho cudromach 's a tha i do mhuinntir nan eileanan, agus iad an dòchas gun tèid aca air sin a chur air dòigh ron t-Samhradh.